Just before it started to get cold, a friend gave me 6 hens. Her mother was moving out of state and couldn’t take her beloved chickens with her so I agreed to take them. Weeks passed and I was convinced that they were duds… old hens that were too old to lay, too old to sell, and too old to eat. I was disappointed because I had approximately 57 egg cartons I was so eager to fill with eggs…. and twins that will go through 4 eggs a day if I let them. In 3 months, my 6 old birds had yielded 3 eggs total. A few months later, I got 5 more hens and 2 roosters. They were 6 weeks old when I got them. We made arrangements to keep them separate from the old birds but still in the same barn. Within 2 weeks of having our new chickens, our old birds began laying. I’ve been getting 3-4 eggs per day… and the best part is I get to go hunting for them each day because I have one or two hens that lay in the most peculiar places – between wall studs, behind boards, and behind feed barrels. Roosters: even though they are young fellas, I think the old gals were inspired by the handsome youngins. Heat Lamps: In the corner of the barn I’ve mounted a heat lamp. They can definitely avoid it, but they’ve made a pile of hay near the heat lamp and have created a cozy place for egg laying. Oyster shell: I was offering oyster shell to my hens from the beginning, but I recently started putting the oyster shell into their crumble food. I don’t mix much in. I think the recommended ratio is 1 lb oyster shell to 20 lbs of crumble. Scraps: But I really think this is more about me than it is about the food. They are much more comfortable with me coming in and out of their space when I bring them snacks. Some of their favorites include veggies or noodles that the kids don’t finish, apples, leftover biscuits and dinner rolls. Space to roam: I used to lock up my birds at night and let them have free range during the day. Now that the youngins are locked up full time until they get a little bigger, my old birds are free ranging all the time. The kinda like having the freedom to roost anywhere they want… in fact one of my gals enjoys the barn rafters. 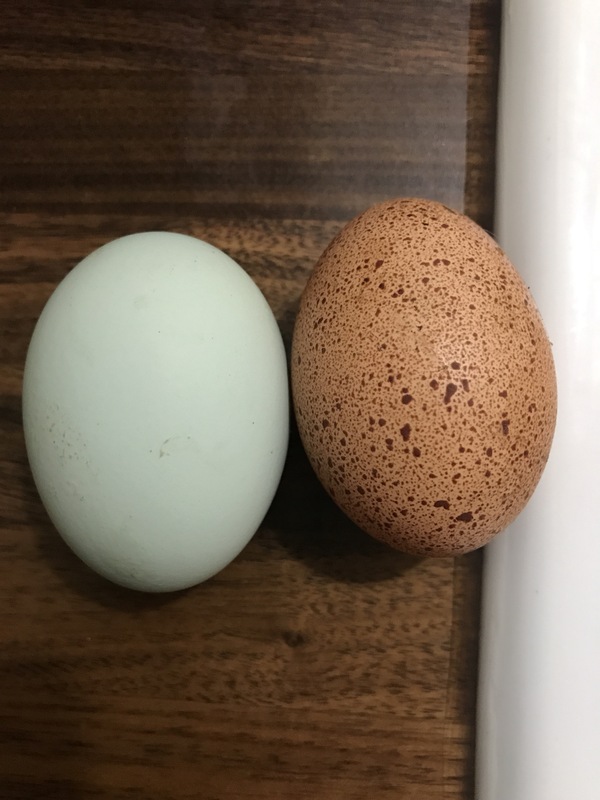 I’m still new at this but based on my flock, happy chickens with the prospect of young love, warm nesting spaces, calcium supplements, tasty snacks, open spaces and high ceilings produce the most eggs. This spring we hope to put build a chicken coop for them so they can have their own private space and get them out of the horse barn. But hopefully we can keep them just as happy. We should have 5 more egg layers by April 1 and we can’t wait to fill up all of our egg cartons! I can’t wait to share some of my favorites egg recipes with you soon so stay tuned!